RARE 1 of only 6 ever made! 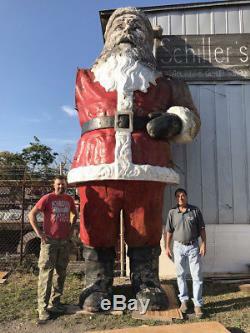 17' Tall Boat Grade Fiberglass Roadside Santa Claus. Built in 1964 by a Yacht manufactured based in New Hampshire USA. During the boat builders slow season they would supplement income by building large roadside statues. This was one of only six that was produced by this company. Four are currently in private collections, one was destroyed and one was lost. We were fortunate enough to discover the lost Santa. Salvaged outside of Daytona Florida, in the backwoods of a private owner. Originally it was presumed that this Santa stood in front of a all year round Xmas store that was located on I75. 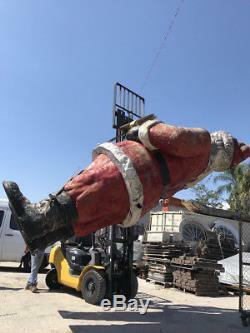 Santa is in pretty fair condition considering its age and where it was salvaged from. 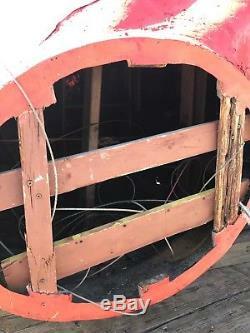 Structurally it is solid with a wood skeletal frame, fiberglass is boat grade and has held up well over time to the elements. There are a few cracks that would need some repair, it would also need a new paint job. It does stand on its own, use of cable tie downs are recommended. 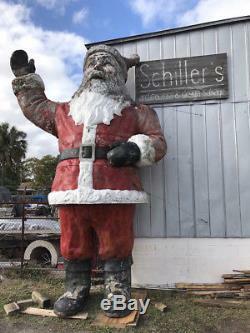 The item "Vintage Giant Roadside Waiving Santa Claus Fiberglass RARE 17' Tall c1964" is in sale since Thursday, March 22, 2018. This item is in the category "Collectibles\Holiday & Seasonal\Christmas\ Modern (1946-90)\Figures\Santa". The seller is "larrschille0" and is located in Tampa, Florida. This item can't be shipped, the buyer must pick up the item.